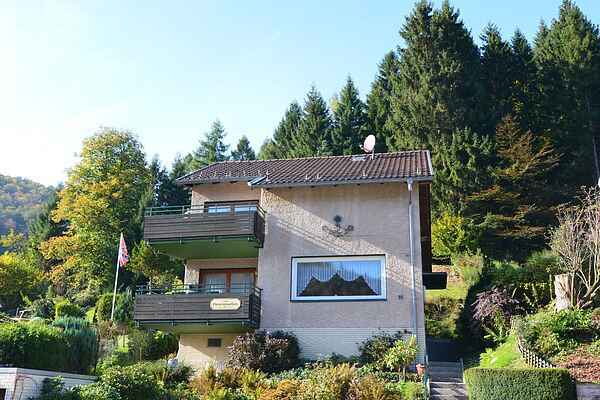 This spacious modern holiday house is located in the village of Sieber, just 5 kilometres from Sankt Andreasberg, one of the best-known skiing and hiking destinations in the Upper Harz. The house is situated in a wonderfully tranquil setting right at the edge of the forest and will enchant you with an unrivalled panorama of the village and the Harz mountains. A warm and welcoming atmosphere awaits you in this cosy house. Everything is designed for maximum enjoyment, so that you can experience a relaxing escape. The house has been lovingly furnished in a comfortable and contemporary design. With their cheerful colour schemes, the bedrooms invite you to enjoy a delightful rest. Both balconies offer gorgeous views of the Harz forests a delight in any season. Upstairs, the special highlight is the large dining table, with room for your whole group to sit together. You are also free to use the garden, where you will find a place to grill. The large leisure facility, with level walks, mini golf, a water-treading basin, a solar-heated outdoor pool and an interesting adventure playground, offers lots of variety for all ages. The village has a combination of two attractions, a nature discovery trail and a river discovery trail, which is unique in the Harz. There are many sport options in and around Sieber. In addition to the network of hiking trails with a total distance of 250 kilometres, you will also find interesting routes for Nordic walking, cycling and mountain biking. Winter sport enthusiasts come for the cross-country skiing on the newly constructed trail, for alpine skiing or snowboarding in neighbouring communities of the Upper Harz or for sleighing on the pristine slope located right in the village and/or on the toboggan runs in Sankt Andreasberg, which are equipped with a lift and flood lighting. Favourite daytrip destinations: Herzberg with Welfenschloss (7 km), Sankt Andreasberg with summer toboggan run, Panorama indoor pool, high ropes course (5 km), Bad Lauterberg with thermal baths, tourist mine and shopping (17 km), Harz narrow gauge railways (40 km) and the famed Brocken (45 km).